Anna Gelyuk is a Moscow-based drummer, percussionist and arranger. 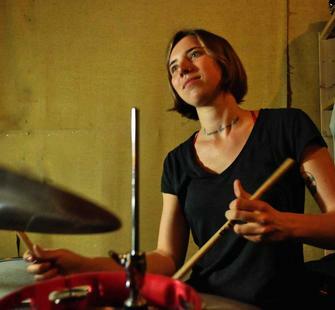 “To me, music is a media for conversation,” says Anna, who majored in philosophy at the Russian University for the Humanities before pursuing drums at Moscow Jazz College. A gifted improviser and sensitive collaborator, Anna brings her knack for complex but infectious rhythms to everything she performs, from experimental classical to straight-ahead jazz. A founding member of the Masala quartet, Anna gigs regularly with the Moscow Jazz College Big Band and numerous other ensembles across the city. In 2014, Anna was selected to participate in Bang on a Can’s international residency at the National Center for Contemporary Arts in Moscow.